Well, we were going to make this announcement next week, but our friends at the post office were able to get our January newsletter into AiG supporters’ homes very early this time, so the word is now getting out about next month’s creation/evolution debate. Our newsletter features an article that gives information on my February 4 debate with evolutionist Bill Nye at our Creation Museum, and social media has now also become aware of the announcement. Most of you will recall Mr. Nye as the bow-tied host of the popular children’s TV program Bill Nye the Science Guy. On his TV program, watched by millions of children over the years both on TV and as videos in science classrooms, Nye promoted evolutionary ideas. In recent times he has often been seen on TV interview shows and YouTube videos, where he has defended evolution. Nye was the “2010 Humanist of the Year” as awarded by the American Humanist Association. Because our ministry theme for 2013 and for 2014 is “Standing Our Ground, Rescuing Our Kids,” our staff thought that a debate on creation vs. evolution with a man who has influenced so many children to believe in evolution would be a good idea. Now, those of you who know me realize that I don’t relish public debates, so please pray for me. But this debate will help highlight the fact that so many young people are dismissing the Bible because of evolution, and even many young people who had grown up in the church decided to leave the church because they saw evolution as showing the Bible could not be trusted. This exodus of young people from the church is documented in my coauthored book Already Gone. It is an important debate to have as we deal with the question, “Is creation a viable model of origins in today’s modern scientific era?” Today’s lead article on the Answers in Genesis website gives more details on this event, including tickets. 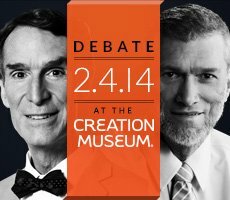 It will certainly be a unique opportunity to be witness in person at the Creation Museum! We will make further announcements regarding the possibility of live streaming video of the debate.